Welcome to one of the most amazing road trip in the world - The Atlantic Road! Situated in Norway, The Atlantic Road (in Norwegian called Atlanterhavsveien or Atlanterhavsvegen) is a part of Norwegian national road 64 (Rv 64). It is close to the cities Molde and Kristiansund in the midwest part of the Norwegian coastline. It is ranked first on The Guardian's list of the world's best road trips! This fantastic and spectacular road is a very popular tourist attraction. Both the local population and tourist visitors frequently use the road to go fishing for cod and other fish directly from the bridges. One of the bridges is special designed for fishing. 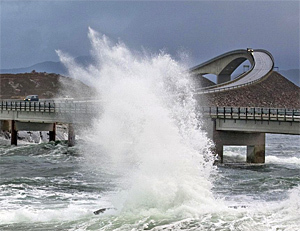 Welcome to visit The Atlantic Road - where you can drive on the coastal edge of Norway! | klikk her for informasjon om hvordan du kan få en reklamebanner !